My mother who I hold so dear, Throughout my life you're always near. A tender smile on your face, You guide my life with light and grace. 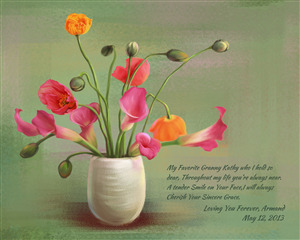 Give flowers that will last a lifetime to dear Mom or Grandma with this personalized fine watercolor print. She'll know how much you care for her. It makes a unique Mother's Day gift.